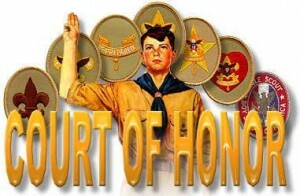 Troop 122 will hold its Spring Court of Honor instead of its regular weekly troop meeting on 18 April 2013 at 7:30. The uniform will be Class A. A court of honor is a troop activity where scouts and their families can come together to get their awards, and have a good time together. It is important for the scouts family members to be there for their scouts receiving his rank advancement, merit badges, and other awards. It is also important for Eagle bound scouts to participate in a court of honor because it does count towards the Second Class Req. 3a and First Class requirement 3.0. It is not a PLC or troop/patrol meeting.